We say that politicians are slimy, our noses wrinkling with disdain – but is that the way we like them? It seems the answer depends on whether we agree with their agenda. With the 2012 election steadily approaching, I wondered whether Democratic and Republican voters hold their preferred candidate and the opposing candidate to similar ethical standards. “Sometimes, politicians engage in activities that are ethically ‘gray’ (e.g. providing favors to campaign donors, not fully disclosing information to the public, scheduling votes when politicians are away, etc.). The other half of participants was shown a picture of Mitt Romney, and asked the same question about Romney’s ethical standards. All participants rated how acceptable it would be for the candidate to engage in ethically “gray” activities on a scale ranging from 0 (completely unacceptable) to 100 (completely acceptable). 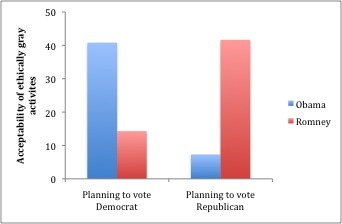 What we found was that participants who were planning to vote Democratic indicated that Romney should be held to a fairly high ethical standard. Republican participants held a similar standard for Obama. But when participants happened to support the candidate in question – whether Obama or Romney – they indicated that ethically gray activities were approximately 3 times more acceptable. This study harkens the age-old philosophical question: does the end justify the means? Judging by the results, it appears that Americans on both sides of the political spectrum feel that it does, at least to a degree. Democrats and Republicans alike are willing to allow for some shady tactics, provided those tactics advance their own ideals. Politicians are in a bit of a bind. On the one hand, they are expected to uphold high ethical standards, while on the other hand, they are supposed to represent their voters. If voters hold a double standard for the ethical conduct of their own candidate and the opposing candidate, the overall standard of ethics is likely to fall to the lowest common denominator. If politicians do get a bit “slimy,” are they the only ones to blame? Who are politicians accountable to, if not their voters? Finally, if the ethical bar is steadily lowered in the service of advancing party agendas, then who is responsible for raising it?